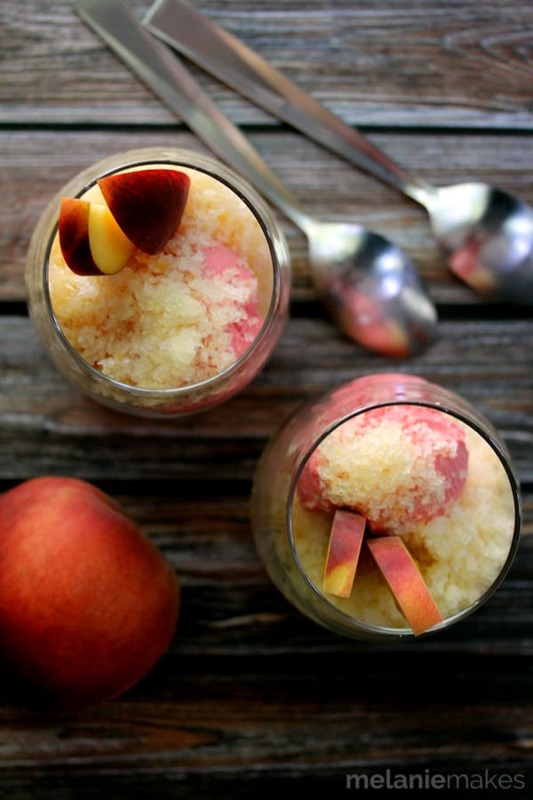 These Peach Granita Sundaes are the perfect end of Summer dessert. Water, sugar, peaches and Riesling wine take a spin in a blender before being poured into a pan and ushered to the freezer. The final touch? Serving this icy, peach goodness over a scoop of ice cream. Sniff, sniff. Today marks our last full week of Summer vacation as the girls start school on Tuesday. I’m feeling a bit clueless as I have no clue where our Summer has gone or what we did for the past 11 weeks. And since I just had to go to my calendar to count how many weeks we’ve had of Summer vacation, I feel even more clueless. 11 weeks? What kept us so busy for 11 weeks? The great thing about going back to school is that means Labor Day is just around the corner which means a shortened school week – I like to ease into things – and of course, one last opportunity to send Summer out in style. I have grand plans of having friends over, making a fire in the fire pit and watching our kids run around in the back yard while the adults enjoy Peach Granita Sundaes. I couldn’t wait to get my hands on a bottle of Gallo Family’s new Riesling wine that they introduced last month. It definitely didn’t disappoint! It’s as if they managed to bottle Summer with notes of honeysuckle, juicy peach, pear and ripe citrus. 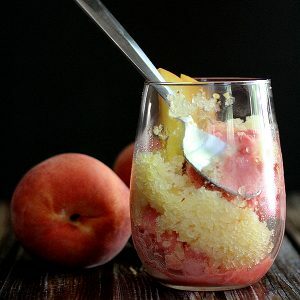 I instantly thought of the two remaining Oregold peaches in my fridge and how amazing they would go together and combined them into the easiest and most delicious Summer treat ever. Water, sugar, peaches and Riesling wine take a spin in a blender before being poured into a pan and ushered to the freezer. It’s a hands off approach for the rest of the process as the only effort needed is to rake a fork across the mixture every so often as it freezes. The final touch? Serving this icy, peach goodness over a scoop of ice cream. The perfect end of Summer dessert. In a blender, add wine, peaches, sugar and water. Blend until fully combined. Pour mixture into a metal baking dish and place in freezer. After one hour, rake top of mixture with fork, scraping ice crystals into middle of dish. Repeat this process every hour for the next three hours. 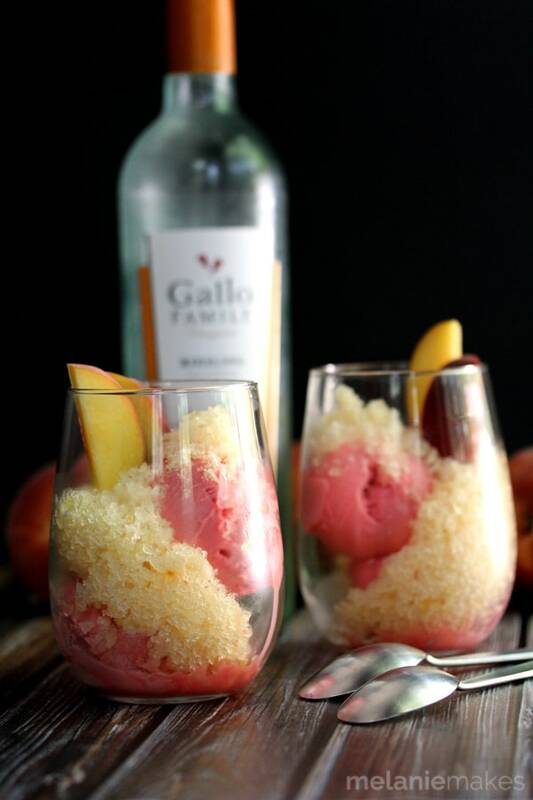 To assemble, add two scoops of raspberry sherbet to glass and top with scoop of granita and slices of fresh peaches, if desired. 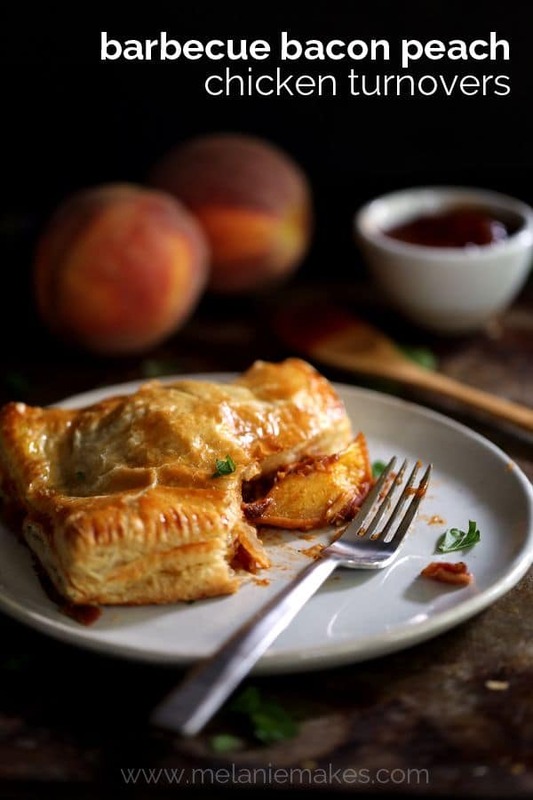 Looking for more great peach recipes? 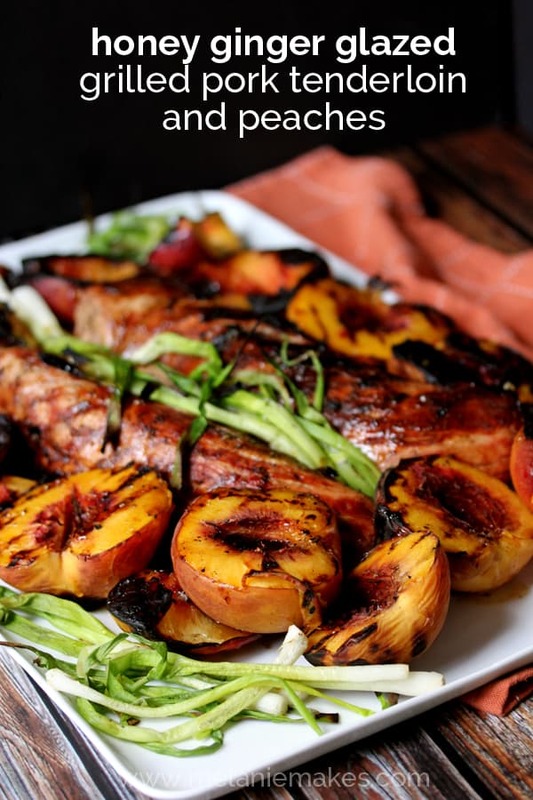 Looking for additional recipes perfect for Labor Day entertaining? Click here for even more recipes for your Labor Day entertaining needs. These sundaes looks so pretty! I have never made my own granita before but this must change! So many of my favorite things in one glass.... can't handle it! These look perfect! I have never made granitas at home before, but I am loving this as a sundae! Such an awesome idea, Melanie! 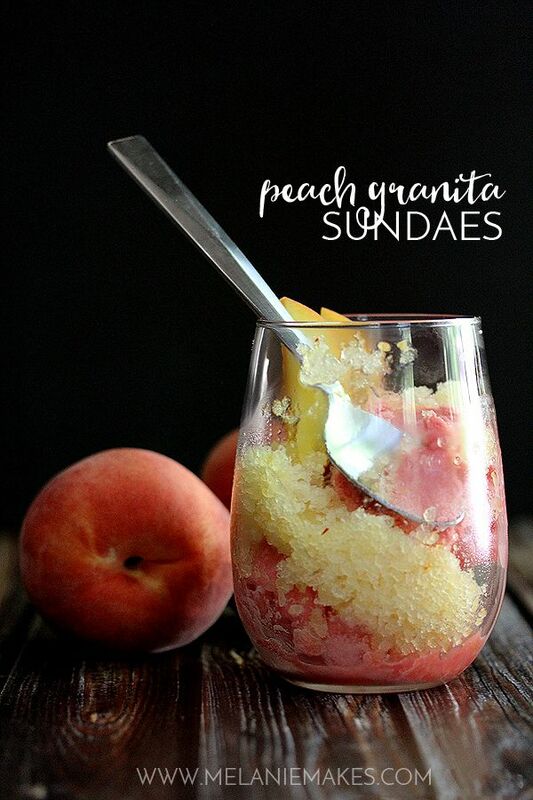 I've only ever had coffee granita, but this peach one looks to die for! I love everything peach, so this is a must on my list! This is my kind of sundae! I can honestly say I have never had one but would have no doubts about my new-found love. I've been wanting to make a granita all summer!! Perfect timing because peaches are in peak season! Oh my! This really does look like the perfect summer treat! Love the combo of peach and riesling! Also really love that this is such a light and fresh dessert for summer that won't weight you down. It just might make you a little tipsy ;) My kind of dessert. What a refreshing take. This is absolutely perfect for the holiday weekend!Passing by from SNF linkup. Have a wonderful evening. Thanks so much for your kind words and stopping by, Tammy! This looks so refreshing! I'd love it with blueberry ice cream or sorbet, too! I have no doubt that blueberry would also be awesome, Brianne! This is just perfect, Melanie. I would love to make this over the LDW for friends visiting us up at the Lake. It looks so refreshing! Thanks, Susan - I bet your friends would love it! Oh, these are so much fun. 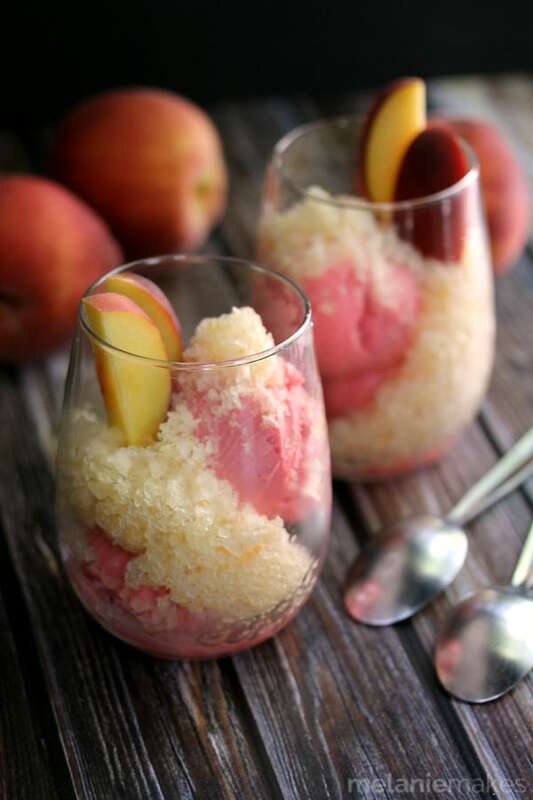 I love that contrast of the granita against the sherbet - so pretty and such inviting texture! Thanks so much for your kind words, Heather! Melanie, i love these!!!! Beautiful and inventive! This is the perfect recipe for end of summer! Absolutely gorgeous Melanie! Thanks so much, Isabel - the new Riesling from Gallo was definitely the inspiration for this recipe! This looks so refreshing. What a delicious end-of-summer treat! This recipe has it all - gorgeous photos, perfect summertime flavors, and healthy too! Thank you so much, Marly - so appreciate your kind words! These granitas look so pretty and refreshing! Thanks, Martha - I can verify that they indeed are! 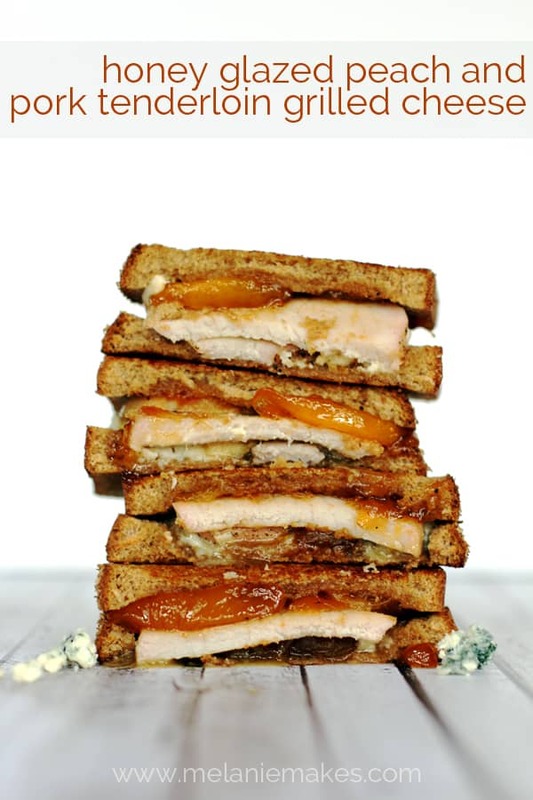 I love recipes that are quick to put together, can be made ahead of time and are going to make everyone's jaw drop. Guess what? 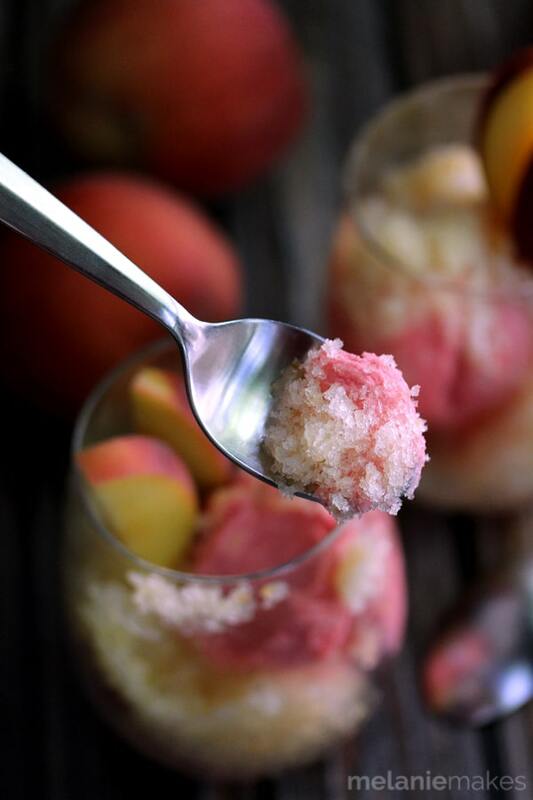 You accomplished all three with this beautiful Peach Granita! Thanks so much for you kind words, Betsy! I cannot get over how amazing these granitas look! The colors are seriously gorgeous...I SO want to try one! Thanks, Katie - let me know if you give them a try! These look perfect!! Loving the peach :) what a wonderful treat to make and relax with tonight! The perfect adult summer treat! I love that this sundae calls for just a few simple ingredients; so much yum! It's definitely a hands-off recipe - WIN! I've had granita on my to-make list for a long time. This looks so refreshing! Oh these look perfect. Love all these flavors. And I would never think to combine a granita with a scoop of ice cream. Totally gonna do that EVERY TIME now! Thanks for sharing! 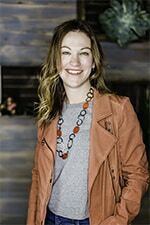 It's definitely a refreshing mix of textures, Liz! A granita sundae? What a magnificent idea! A marvelous way to cool off...and please the palate.! Perfect for any summer gathering! What a great frozen treat with the different flavors and textures together. The icy crunchiness of the granita and the smooth creaminess of ice cream. Total yum.